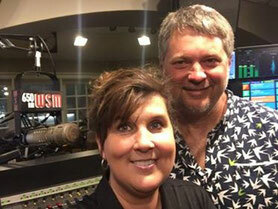 With America's Trucking Sweetheart MARCIA CAMPBELL from Nashville's WSM radio show "THE ALLNIGHTER". 2017 live interview and CD presentation for TRAVELIN' GUITAR MAN. 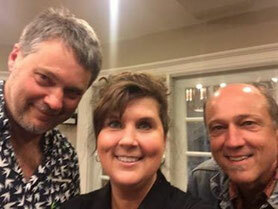 Dan, Marcia and Gregg Stocki! 2018 & 2019 Backing GEORGETTE JONES, a fine singer and great stage personality. 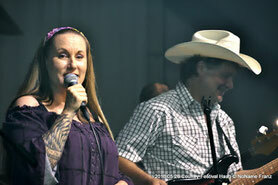 Georgette is the daughter of country legends GEORGE JONES and TAMMY WYNETTE. 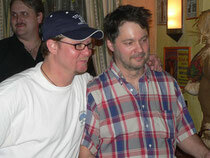 Dan met Charlie for the first time in Mrongowo, Poland in 1993. 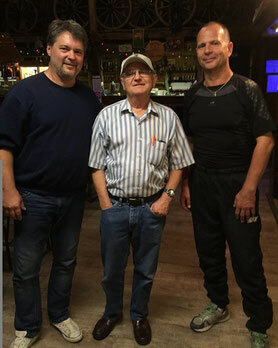 Dan shared the bill with Charlie and David Ball. For 18 years this multiinstrumentalist directed the music and advised in the audio/video booth, that Hee Haw's productions did honor to the artists. Dan and millions of others knew who Charlie was and he was one of the few backing instrumentalist (along with Chet Atkins and Buddy Emmons) who in their own rights became "stars"...although Charlie probably would not like a nomer such as "star". But he was and is just that, especially to fellow musicians. Dan and Gabor had never played a note with Charlie. There was no time for a rehearsal with the harp king! He talked Dan through his arrangements and the first time Gabor and Dan made music with him was when he came on stage. They had studied the sheets he sent and listened to the songs and were basically prepared. There would be no mistakes because Charlie said beforehand, not to worry and have fun and little accidents were not mistakes...it was live. 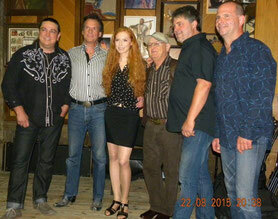 Milo, Hans Molenaar, Jitka, Charlie, Dan and Gabor before the show. Hans has played drums for more than 20 years when Charlie hits Europe. He was the rock to build on knowing arrangements. Jitka on fiddle and Milo, electric guitar. Gabor did an amazing job at learning all the music..ca 25 songs and Charlie commented that it was the first time in a long time that he had worked with a upright bass player. I think he was truly pleased with everything. Charlie's wife took this picture after a big, extended breakfast in the saloon. Dan was merciless in queries about Hee Haw and Charlie laid down the intricate stories about how things went down.He liked Buck Owens style which was professional and organised, making Charlie's job easier. He remarked on the change in Buck after his best friend and musical copilot Don Rich's death. Lots of Bob Dylan information. Charlie can be heard on Dylan's recordings. Charlie has a very sober opinion of the great folk bard but also is thankful for his coming to Nashville to record because of the huge upswing in studio work that occured afterwards for the whole musician's community. Anyway, this is just one great human being and still at 74 a masssive talent. 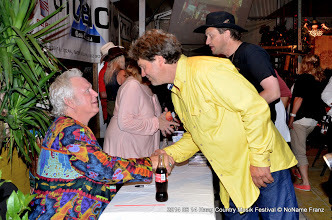 After playing piano for TGraham Brown in Haag, Austria in 2014. Powerful voice and an emotional singer. As the old masters pass away, relatively young cats like TGB move in to fill the gaps. With TG Sheppard. 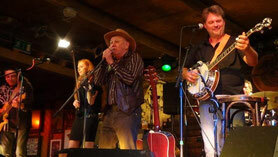 Dan played in his backup band in Austria in 2013. TG had a score of nr 1 hits in the 70s and 80s! With Greg Stocki, top drummer and dude! 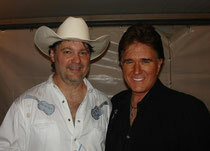 Worked with Becky Hobbs, Marty Stuart, Lorrie Morgen, Tracy Lawrence and presently with the Bellamy Brothers. Since 2010, Gregg has also done several tours with Daniel and built up a nice following in Germany, Austria and Holland! Gregg is featured on Dan's 2011 album, JENNY WORKS IN THERE. 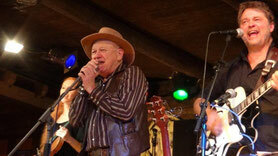 With Tracy Lawrence, in Four Corners, Untermeitingen, Germany. Dan did the opener. Tracy is a Grammy nominated singer named best new male country artist by Billboard, 1991; named top new male vocalist, Academy of Country Music, 1993. At soundcheck, Tracy and Dan were talking and Tracy said, "Well, play my songs over here." Dan thought but did not say, "Play mine over there!". 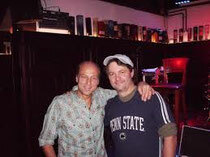 Gregg Stocki was playing with Tracy at the time and Dan and Gregg reconnected after having last seen each other in Sunset Park, in southern Pennsylvania when Gregg was drumming with Marty Stuart. With Billy Yates. Has written some mammoth songs "Choices" and "I Don't Need No Rockin Chair" which were hits for the late George Jones. Met the man lots of times, shared the bill and had some good long talks about music and American life.